Easy way to refresh and update home décor is to introduce colorful attractive throw pillows that visually pulls the attention with a simple budgeted switch over. The colors, texture and shape will add a total different feel to any space. There are simply so many options! Take time to choose from the list below for maximum colorful impact. Do you really love to take your pet everywhere? That is sometimes not possible. So, better take these cute printed pillows and feel the love of your little pet near you always. The peeking cat is for crazy cat lovers, realistic personalized mini plush dog cushion looks very real representing the pure love for pets. 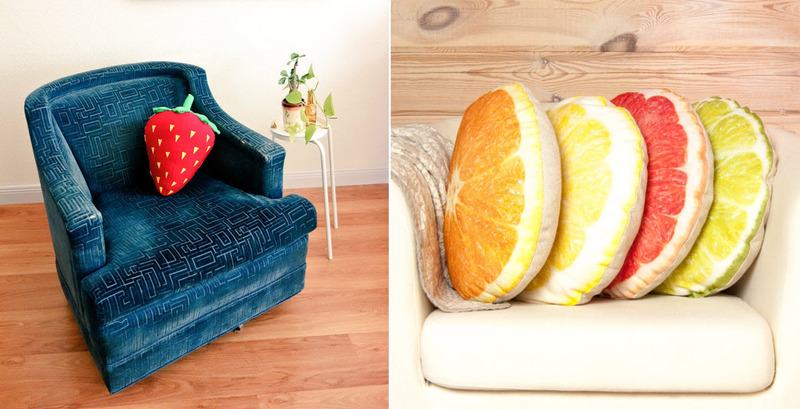 Add a fruity touch to your home interiors with the citrus fruit pillows and strawberry pillows. These colorful additions are especially appealing and amusing in its own way. Create unexpected look indoors with these peppy fruity cushions. Get sinked with the silky beauty and comfort of the rich textured throw pillows. The red silk Mongolian cover pillow will boost up the looks of the room. The silky-smooth cushions create a subtle lovely depth that enriches the beach style living room. The interesting mix of colors makes it more lavish and cool. Luxurious velvet adds a pop of warmth and unexpected vibrancy to indoors. The teal blue round pillow, velvet flower pillows would make a great accent cushion for an armchair or bed. Shiny bold mismatch colors that is contrast with the sofa color looks cool and smooth. These pillows are specially for crochet lovers. The heart knit crochet pillow is apt for a rustic themed décor and the crochet floor cushions with stars is perfect for accentuating dull rooms. A soft splash of color is ready to decorate your little one’s wonderland. The colorful shiny pillows are for your super little stars, organic hippo pillows will create pure cheerful statement even in dark backgrounds. Cuddly friends for an ideal makeover to kid room. Throwpillow with Unusual patterns will always look more exciting and pretty cool in home décor. The vintage camera throw pillows, the rough look log pillows will adorn indoors with unique style and comfort. These cool unimaginable softies are stunning attention grabbers. A room without a colorful throw pillow! Isn’t something missing to feel complete? These peppy additions are sure to transform the look of interiors. Your complete colorful dream home is very easy and affordable with these soft and comfortable decors. Unique pics related to the article is always welcome from your side. SPRUCE UP PLAIN SOFAS AND CUDDLE UP….